Turnips have been grown in Europe since prehistoric times, according to Purdue University. Similar crops of white root vegetables are grown in many parts of the world, including Asia. 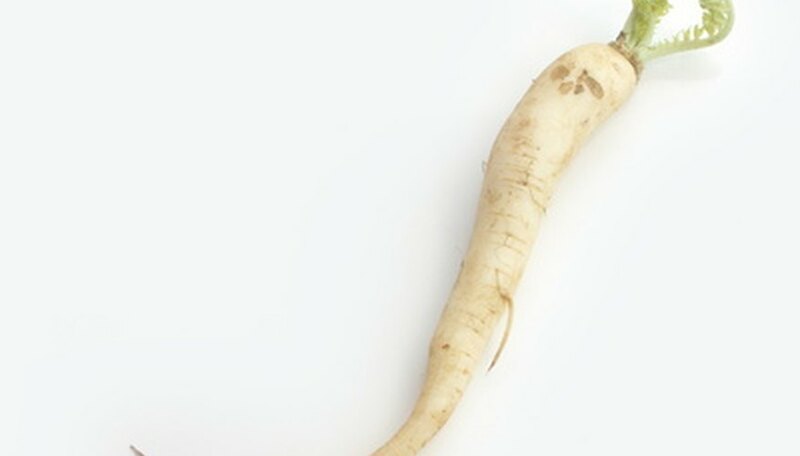 The Japanese daikon is a carrot-shaped vegetable of the turnip family. Companion planting is an organic gardening technique of planting other vegetables near, around or sometimes interspersed with another crop to reduce pests and increase soil fertility. Companion planting has been done by Native Americans since prehistoric times. "Three sisters" techniques, in which corn, squash and beans are planted together in a mound, provide support structures for the beans and a balance of soil nutrient use that prevents soil exhaustion. Ancient Roman scholar and agriculture expert Marcus Terentius Varro discovered that planting large oak trees around a farm was an effective insect deterrent. Companion planting for turnips can reduce insect damage and fertilizer requirements. Because turnips are a root vegetable, they do not have the same difficulties with insects as aboveground vegetables. Companion plants can help maintain soil nutrients, much like plants that add nitrogen to the soil. Companion planting can reduce the need for synthetic insecticides and fertilizers. If you plant in a small plot year after year, monoculture--the planting of a single crop in the same patch year after year--can reduce the nutrients in the soil to the point that it will become progressively more difficult to grow that crop in that spot. Companion planting, especially for turnips, maintains long-term soil health and helps your garden plot or field to produce turnips more consistently over time. Peas are a nitrogen-fixing plant that are very good companions for turnips. Cabbage is a good companion for turnips because of the turnip’s tendency to repel certain pests. Turnips, a natural aphid repellent, are known as a good companion for plants that are susceptible to this pest. Because companion planting is not an exact science, it is sometimes not as effective as other methods of fertilization and insect control. Some plants do not work well with a particular species. Do not plant potatoes or other root vegetables, for example, near your turnips. These vegetables can compete for nutrients with the turnips and reduce crop size and yield. Other plants that do not do well with turnips are radishes, delphinium, larkspur and mustard. Why Is My Sweet Corn Growth Stunted? Why Are My Turnip Greens Bitter?